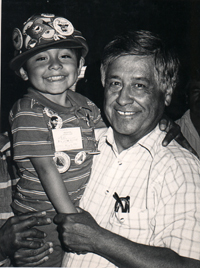 California has established an official state holiday to honor Latino labor leader César E. Chávez, born on March 31, 1927. César Chávez Day is intended to promote service to the communities of California in honor of Chavez's life and work. It will be celebrated on March 31, or the appropriate Monday or Friday following or preceding that date. Information provided on these Web pages is a standards-based model curriculum on the life and work of César E. Chávez. The curriculum is provided for grades Kindergarten through 12, with biographies, pictures, and other resources provided to help teachers prepare lessons for this state holiday. Information provided on these Web pages are resources for the general public interested in the life and work of César E. Chávez. Included are many pictures and documents scanned from the Walter Reuther Library archives at Wayne State University along with numerous other pictures and documents. The site contains many original scanned documents and pictures from the Walter Reuther Library archives at Wayne State University and Fred Ross Collection. This is the first time they have been made available outside of the archives. There is also an audio clip and transcripts from 50 interviews of people who knew and worked with César E. Chávez. In addition there are photos from Victor Aleman, Bob Fitch, El Malcriado, Cathy Murphy, Cris Sanchez, Elmar, Futirsoff, George Ballis, Glen Pearcy, Hank Gableem, J. Salazar, Manuel Echavaria, Sebastian, Jocelyn Sherman, and the UFW.